There's no place like home (or your home away from home) for the holidays, and there's plenty of good cheer to go around up north in West Michigan! Whether you live here, or plan to visit, check out all these great ideas and events to make your holidays bright. You can't beat the festive friendliness and magical lights of shopping at a local merchant. Their success depends upon your support and you will find the royal carpet treatment when you come in from the cold to browse. The friendly merchants of Pentwater welcome you to their Christmas in the Village celebration, beginning November 24th. Hart has its Home for the Holidays event beginning November 23. Ludington also schedules special activities in its downtown for Small Business Saturday on November 24, ending with the Aglow on the Avenue Parade.. Scottville generally hosts its Christmas festivities on the second week of December with Santa, games, and the tree lighting. While in Ludington, you'll find many fine gift ideas with a local flavor and that's just the beginning. Small town services, big smiles, and that great feeling that you shopped local, helping to support small businesses who go out of their way to give you their best. Find laughter and good cheer by catching a holiday performance at a theater, or attend one of the many local concerts sure to fill you with the spirit of the season. View the concert and performances information here and get your tickets today. Looking for a one-of-a-kind item for a very special person? The offerings at local arts or crafts shows are unique and hand-crafted. Check out this information about local arts and crafts shows and enjoy finding just the right item to deck the halls or warm a heart. How lucky are we? 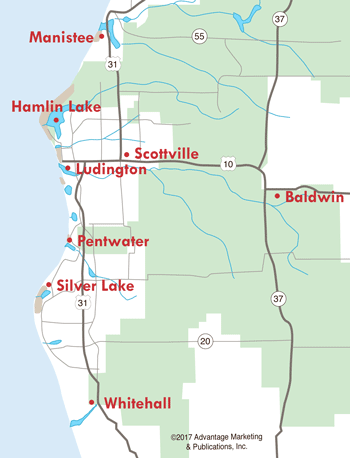 Santa visits us up north in West Michigan at several different times and locations. Santa travels to Pentwater on November 24 at 5pm for the Pentwater Festival of Lights and Christmas in the Village. Downtown Hart also has its Santa Parade in the Historic District November 23 starting at 6:30pm. Following the parade you can visit with Santa and enjoy cider, donuts and coffee. 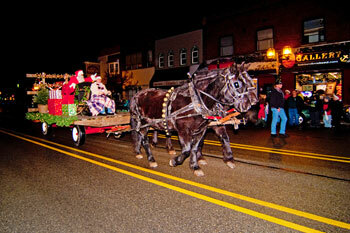 Santa ends his travels that Thanksgiving weekend Saturday in Ludington for the Aglow on the Avenue Parade. After traveling through the parade, Santa and Mrs. Claus visit with children at Sandcastles Children's Museum from 7-8pm. Early December is magical, with Santa's arrival at the Manistee Victorian Sleighbell Parade and Old Fashioned Christmas Weekend. It's a unique and special way to welcome the New Year....the Lighted Ball Drop in downtown Ludington at midnight. At six feet five inches in diameter and 6,000 bright LED lights...this annual event brings thousands to the area. While you're waiting for the ball to drop, meet friends and enjoy a meal at downtown restaurants, shop in the many stores open late that night and get ready to bring the New Year in! 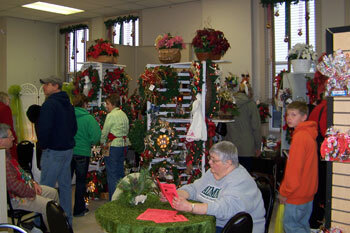 Enjoy the Winter Season in Manistee County!